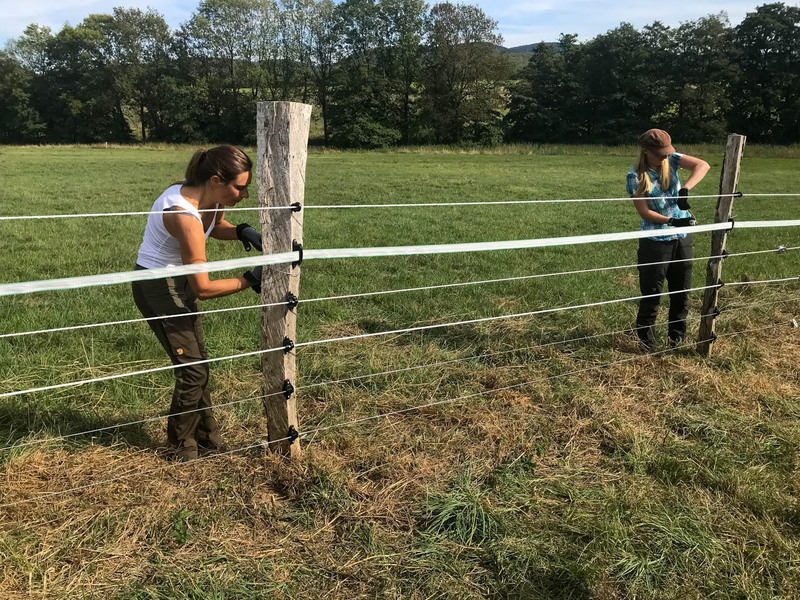 Prior to the “Pathways Europe 2018: Resurrecting the Wild” focusing on the human dimension of the conflict with wildlife, the Livestock protection group of the Naturschutzbund Germany held an informative workshop on building protective fencing for sheep, horses and cows. As the wolves are returning all across Germany, the livestock protection is becoming a key element to reduce the conflict with the agricultural communities. Especially since we know that proper protection is more effective than killing wolves. International cooperation and exchange of experiences is therefore key, also when it comes to wildlife tracking for example. The participants were informed about the challenges and the benefits of using Livestock Guarding dogs to protect riding horses from wolf predation. They learned to set-up Flexinet fencing for sheep and goats. Flexinets are used often in a mobile setting and the workshop was led by Nicole Benning from the Schäferei Wümenniederung and Peter Schütte from the Naturschutzbund. Flexinets are typically 90-106 cm high, are electrical charged and are used in mobile temporary settings. Such proper set-up fences are sufficient according to the research and experience from Switzerland to prevent wolves from attacking sheep and goats. The second half of the workshop was spent on the actually building of fixed fences typically used to manage horses and cows. These fences are up to 160cm high due to the size of the livestock. The participants learned to fix the wires and to wooden poles using insulators and other fixtures, the setup of electrical fence energizers and the proper grounding to achieve the desired 10 000 Volt with 6 Joule along the whole fence. Wolves fulfill a very special niche in nature and they prey on rodents and other smaller food items and keep their numbers under control. Take an educated look at Yellowstone Park in the USA.